Often TeamSupport users find it necessary to enforce mandatory fields which must have a value. 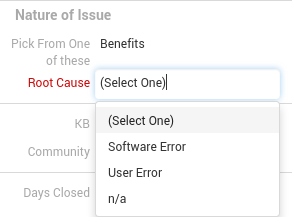 We make this quite simple by having a checkbox for “A Value is Required” or “A Value is Required prior to closing a ticket” in the custom fields setup. It is important to note that this only applies to custom field types that are Text, Date and Pick List. From Admin->Custom Fields tab, create a new or edit a custom field by clicking on the pencil icon next to the custom field you would like to edit. A Value is Required – a user will not be able to make a change to a ticket without first filling out the custom field(s). 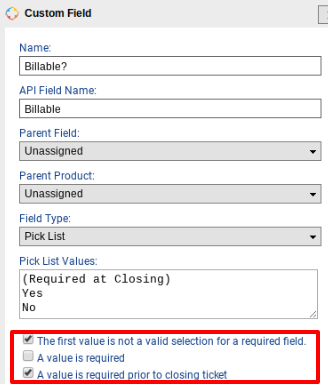 A Value is Required prior to closing a ticket – a user will not be able to select a “closed status” for a ticket without first filling out the custom field(s). If you select “Visible on Portal” as well as “A value is required”, this will require your customer to populate this custom field from your Customer Hub.